Yorkshire Terrier January 26, 2019 April 4, 2019 No Comments on How to Reduce Yorkie’s Barking? Never fulfill any of your dog’s demand when he is barking, like giving him food or taking him outside for a walk. This will reinforce his behavior and he will think that he gets your attention when he barks. You should not shout at your Yorkie or punish him when it is barking. It will only confuse him because he does not know that he is doing something wrong and his barking is causing you to become angry at him. A few people use shock collars to punish Yorkshire Terrier which is totally inhumane. It is in Yorkie’s nature to bark when it senses some unusual thing happening for e.g., ringing of a doorbell, seeing some stranger etc. This is called disturbance barking. There is a certain kind of training to control disturbance barking. Consider an example of ‘Barking at the doorbell’ This training aims to make you understand that he will receive no attention while barking but will receive a reward if he remains calm. The dog will start barking and you have to ask him to sit. Try to calm him down and pat him. When he stops barking appreciate him with some kind of yummy treat. Do reverse if your dog does not stop barking. 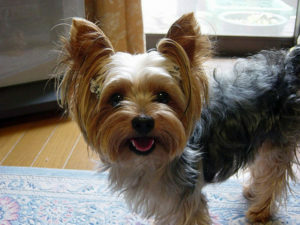 You should give calm and relaxing home environment to your Yorkie. Do not leave your Yorkie alone at home for a longer period of time. Barking can be caused due to frustration, anxiety, and boredom. Giving your Yorkie a collection of interesting toys will help to deal with its boredom and anxiety. There are a number of training toys in the market that aids in teaching your dog to sit, lie down or to speak. To control your dog’s outdoor barking you need to divert its attention from outside things and have to teach him so.